Oh sure, I'd like to think I'm all sartorial and stuff but the fact remains that I'm really not. What I am is a rebel. I used to dress casually but then everyone else jumped on that bandwagon and ruined my little niche. So it's rebellion through coat and tie. I'm a Software Engineer so it's fitting that I enjoy soft wear. Silk neckwear. Quite often I deal with patterns and "textures" in my vocation so I've extended that a bit to my daily wear. We'll see how the research and development, uhmm, develops. Again with the Navy sportcoat. Like I've already said -- it's too easy to throw something together. Monday are almost required to be easy conglomeration mornings. I made it even easier by selecting a blue, spread collar, pinpoint oxford dress shirt. I picked it because I have plans for the white spread collar later in the week and that's the only other shirt I would have worn with the necktie I selected. The necktie is yet another Jos A. Bank Signature Collection model. The diamonds are different shades of blue and silver. 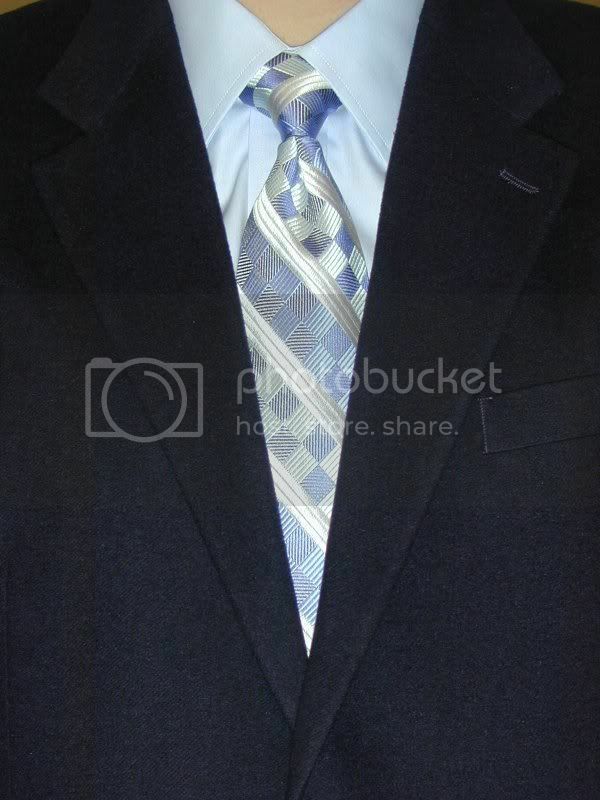 The silver stripes woven "over the top" of the diamonds make it more interesting tha just a regular stripe or geometric necktie. It's another Ebay purchase that I got in the mail Friday. I thought about wearing it to church yesterday but decided I'd rather wear the new gray sportcoat instead. Spread collar, half Windsor knot. Usually, anyway.